Chris Arreola just did what most of us expected. He stopped Seth Mitchell in 1 easy round. It was over so fast that it proves absolutely nothing. No real surprise here. Mitchell simply isn’t that durable and it showed again. While the victory probably doesn’t prove much in the grand scheme of things, Arreola just gained some momentum. This is especially true if you consider how poorly he fared in his previous fight against Stiverne. The celebratory pushups by Arreola were probably a bit much, but this was Chris’s biggest win in a long time, or at least his flashiest and most explosive win under a televised spotlight. He had reason to be happy. He actually even appeared trimmer and thinner than he has in years. Dare I say he almost looked like a fit professional prizefighter. Arreola finally seems to be picking up the pieces and putting them back together, something he promised to do after losing to Vitali but never did. Where does Arreola go from here? How about Deontay Wilder? A lot of fans probably would like to see him go against undefeated American Deontay Wilder. There are a lot of similarities between Wilder and Mitchell, notably that they are both inexperienced at a high level and they both have always had big question marks surrounding their shaky chins. Mitchell has proven to be a failure on this front. Many believe that Wilder’s durability, or lack thereof, is in the same league as Mitchell’s. What makes a bout between Arreola and Wilder interesting is the fact that, unlike Mitchell, Wilder has far better skills, a lot better athleticism, and superior physical tools. Personally, I would not be surprised if Arreola also stops Wilder. Probably not so early, but still within 5 rounds or so. But this one isn’t a foregone conclusion like tonight’s mismatch. Interestingly enough Arreola may also represent one of the worst style match ups for heavyweight king Wladimir Klitschko. That’s something that was reinforced tonight with Arreola’s display of power. I know, I know. Arreola has failed whenever even remotely stepping it up, and chances are Wladimir outclasses him with ease. Wlad probably beats Arreola 9 out of 10 times. But those are better odds than I’d give any other heavyweight against Klitschko. Chris Arreola should get another big fight soon and who better for him at this juncture than Deontay Wilder? It’s a match that makes sense for both boxers. 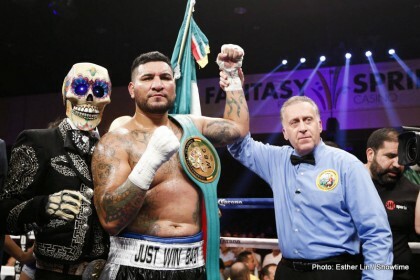 Next boxing news: Arreola Destroys A Game Mitchell – Wilder Or Stiverne II Next? You are here: Home / Boxing News / Can Chris Arreola Do the Same Thing to Deontay Wilder?